Birthplace : Scottville, North Carolina, U.S.
Earl Eugene Scruggs is an American musician noted for perfecting and popularizing a 3-finger banjo-picking style (now called Scruggs style) that is a defining characteristic of bluegrass music. Although other musicians had played in 3-finger style before him, Scruggs shot to prominence when he was hired by Bill Monroe to fill the banjo slot in the "Blue Grass Boys". The instrumental sound most closely associated with bluegrass music--a banjo picked at furious pace with three fingers--was created by Earl Scruggs, a country picker from rural North Carolina. As a member of Bill Monroe and the Blue Grass Boys, and later as half of Flatt and Scruggs, Scruggs literally sent bluegrass in the direction it has followed to this day. His banjo virtuosity was an amazing novelty in 1945; today it is a requirement for every bluegrass band. In Country Music U.S.A., Bill C. Malone writes that Scruggs "added a new and dynamic ingredient to the Blue Grass Boys sound, and audiences were bowled over by the boy who, with a shower of syncopated notes, had made the banjo a lead instrument capable of playing the fastest of songs. Here was something new under the sun." 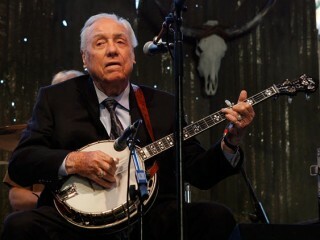 Earl Eugene Scruggs was born in Flint Hill, North Carolina, and raised on a farm in the foothills of the Appalachians. He was one of six children. His father died when he was four, but the family kept itself solvent by farming and performing; two of his sisters played banjo, and his mother played the organ. Earl himself picked up the banjo at an early age, and he imitated the three-finger picking style that was common in his region. In Earl's youth the three-finger style was relatively rare, but it offered several advantages. It had a more fluid sound, was closely tied to fiddle music, and used a G tuning that was more compatible with other stringed instruments. Earl could play the banjo before he entered first grade, and by the age of ten he was devising new "licks" of his own. Before World War II Scruggs worked as a professional musician, first with his brothers and then with several groups, including the Carolina Wildcats and the Morris Brothers. These groups broadcast over radio stations in Gastonia, North Carolina, and Spartanburg, South Carolina. When America entered the war, Scruggs quit performing for work in the textile mills; he often labored seventy-two hours a week for weeks at a time. Music was merely a hobby for him during that period, but after the war he began to perform professionally again. For a time in 1945 he played with "Lost" John Miller on a WSM Radio Saturday broadcast out of Nashville. Then, when Miller quit the business, Scruggs was hired by Bill Monroe. Bill Monroe and the Blue Grass Boys were a favorite on the Grand Ole Opry, and many musicians dreamed of a chance to play in the group. When Scruggs joined in 1945 he caused an overnight sensation. The banjo was traditionally a supporting instrument in string bands, and most banjo players were comics who clowned onstage. Scruggs was dead serious in the spotlight, and the avalanche of notes that cascaded from his banjo astounded audiences. Neil V. Rosenberg notes in Stars of Country Music that Scruggs's version of banjo picking "sounded fresh, new, and exciting, especially at the higher pitch and tempos of the Blue Grass Boys." Monroe was quick to capitalize on the talents of his young protege. Malone writes: "In the three-year period from 1945 to 1948 the banjo assumed a prominence in Monroe's music that it had never enjoyed in any previous band.... Throughout the nation, largely unnoticed by the more commercial world of country music, a veritable 'bluegrass revolution' got underway as both fans and musicians became attracted to the music." In 1948 Scruggs quit the Blue Grass Boys and formed his own band. His partner, Lester Flatt, was also a veteran of Bill Monroe's group, as were band members Jim Shumate, Cedric Rainwater, and Mac Wiseman. Calling themselves Flatt and Scruggs and the Foggy Mountain Boys, the group signed with Mercury Records and began performing in a style very similar to Monroe's. Scruggs quickly transformed his banjo into the lead instrument (Monroe had often led with mandolin), and when he was not picking the banjo he led with equally impressive guitar picking. He also began to write "breakdowns" for the banjo, imitating the furious fiddle music that had been so popular for generations. His first instrumental release was "Foggy Mountain Breakdown," one of the most famous bluegrass songs ever written. Used as the theme for the 1968 movie Bonnie and Clyde, "Foggy Mountain Breakdown" finally made a place for itself on the pop charts after selling well in the country market for nearly two decades. It is still a staple in the repertoire of almost every bluegrass band. Flatt and Scruggs and the Foggy Mountain Boys toured and recorded at an exhausting pace throughout the 1950s. By 1960 theirs was the best-known bluegrass band in America; the "folk revival" of the early 1960s opened up new audiences on college campuses and in the big cities of the North and West. Their "Ballad of Jed Clampett," the theme for the "Beverly Hillbillies" television show, topped the country charts for a number of weeks, and they were the first bluegrass band ever to play a concert at Carnegie Hall. Rosenberg claims that by 1963 "Flatt and Scruggs were becoming a household name, a synonym for country music.... The 'hot' band, the one everybody was listening to, was the Foggy Mountain Boys; a good banjo picker was said to sound 'just like Earl Scruggs.'" Bluegrass purists were therefore dismayed when Scruggs began to lead the group in new directions. Flatt and Scruggs recordings in the later 1960s included snare drums, synthesizers, harmonica, and twelve-string guitar. Scruggs himself often played guitar rather than banjo, and the repertoire began to include works by folk-rock songwriters and Scruggs's three rock-oriented sons. Flatt did not approve of this "progress," so the group disbanded in 1969. Flatt formed his own ensemble, the Nashville Grass, and Scruggs formed the Earl Scruggs Revue, a showcase for his sons Gary, Randy, and Steve. The Earl Scruggs Revue sported electric guitars, piano, drums, and even a Moog synthesizer--all completely "taboo" at the time for bluegrass bands. Rosenberg notes, however, that many younger fans "liked ... and approved of Earl's new group. After all, bluegrass music had not been a static form in 1948, it had been an innovation. After twenty-five years, it was time for further innovation." Indeed, adds Rosenberg, "Earl's band was part of the new country-rock movement which was gathering momentum." Scruggs still performs occasionally with his Earl Scruggs Revue, a band he calls a "no-cubbyhole, category-free, barrierless approach to music." He told the Country Music Encyclopedia: "Music can't stand still. I've always been for progress and keeping up with the times." This should come as no surprise, since Scruggs's signature "progressive" banjo playing helped to create bluegrass music and to make it the dynamic form of entertainment it is today. In 2002 Scruggs won a second Grammy award for the 2001 recording of "Foggy Mountain Breakdown", which featured artists such as Steve Martin on 2nd banjo solo (Martin played the banjo tune on his 1970s stand-up comic acts), Vince Gill and Albert Lee on electric guitar solos, Paul Shaffer on piano, Leon Russell on organ, and Marty Stuart on mandolin. The album, Earl Scruggs and Friends, also featured artists such as John Fogerty, Elton John, Sting, Johnny Cash, Don Henley, Travis Tritt, and Billy Bob Thornton. On February 13, 2003, Scruggs received a star on the Hollywood Walk of Fame. That same year, he and Flatt were ranked #24 on CMT's 40 Greatest Men of Country Music. -Flatt & Scruggs with the Foggy Mountain Boys Harmony, 1960. -Songs of Our Land Columbia, 1962. -Flatt & Scruggs at Carnegie Hall Columbia, 1963. -Flatt & Scruggs at Vanderbilt University Columbia, 1964. -The Original Sound of Flatt & Scruggs Mercury, 1964. -Flatt & Scruggs with the Foggy Mountain Boys Mercury, 1964. -The Golden Era of Flatt & Scruggs Rounder. -Flatt & Scruggs' Greatest Hits Columbia, 1966. -Lester Flatt and Earl Scruggs Columbia. -20 All-Time Great Recordings of Flatt & Scruggs Columbia. -The World of Flatt & Scruggs Columbia. -Sacred Songs/Great Original Recordings Harmony. -The Mercury Sessions: Volume 1, 1948-1950, Volume 2, 1950 Rounder, 1985. -You Can Feel It in Your Soul County, 1988. -I Saw the Light with a Little Help from My Friends Columbia. -The Earl Scruggs Revue Live at Kansas State Columbia, 1972. -Rockin' 'cross the Country Columbia. -The Earl Scruggs Revue Columbia.